It appears that a complete edition of Injustice 2 is on the way for PlayStation 4 and Xbox One. Two retailers (including Amazon) listed Injustice 2 Legendary Edition as a new version of NetherRealm’s fighting game that would include “10 additional characters,” and five premiere skins. 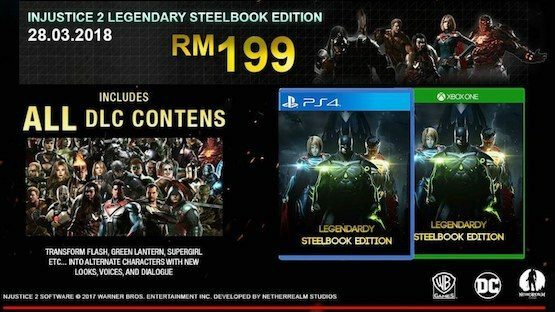 The listing on Amazon was only digital, while Malaysian retailer Impulse listed a physical edition of the game that comes with a steelbook (pictured above). The release date appears to be soon, as a March 3, 2018 date was listed.